The University of Chicago on Sunday announced that its main campus would be largely closed today, with classes called off, due to a threat of gun violence. The development comes amid worries at many colleges about threats as well as incidents of actual violence. Western Washington University called off classes last Tuesday due to threats that the university's president has now detailed. And Sunday evening, two film students in Los Angeles set off a panic -- and were arrested -- when they appeared with replicas of weapons on a freeway overpass. During the day on Sunday, a former employee of Ohio State University killed himself in a campus arts center. University of Chicago President Robert Zimmer announced on Sunday the plan to close the Hyde Park campus today. “The university was informed by FBI counterterrorism officials today (Sunday) that an unknown individual posted an online threat of gun violence against the University of Chicago, specifically mentioning ‘the campus quad’ on Monday morning at 10 a.m. Based on the FBI’s assessment of this threat and recent tragic events at other campuses across the country, we have decided, in consultation with federal and local law enforcement officials, to exercise caution by canceling all classes and activities on the Hyde Park campus through midnight on Monday,” said an announcement  from Zimmer posted on the university's website and sent to all students and employees. Faculty and staff members without emergency duties are being discouraged from coming to the campus today. Zimmer added that "the university will have an increased police and security presence on and around campus, including police personnel with visible weapons and other additional measures. University security personnel are keeping in close contact with the FBI, which is continuing to investigate the threat." UPDATE: A student at the University of Illinois at Chicago has been arrested in the threat, The Chicago Tribune reported. The Tribune also reported that the threat was to kill 16 white male students or employees at the university in retaliation for the shooting death last year -- by a Chicago police officer -- of Laquan McDonald, 17. The police officer -- now facing murder charges -- shot McDonald 16 times. The online threat said: “This is my only warning. At 10 a.m. Monday morning, I'm going to the campus quad of the University of Chicago. I will be armed with an M-4 carbine and two desert eagles, all fully loaded. I will execute approximately 16 white male students and or staff, which is the same number of time McDonald was killed. I will then die killing any number of white policeman in the process. This is not a joke. I am to do my part and rid the world of white devils. I expect you do the same.” The Tribune cited a police report it obtained as the source for the information. The Tribune report may be found here . Historically, colleges receive numerous threats and have been hesitant to close campuses, in part because of the volume of threats, and the pattern of finding many of them to be by people who aimed only to scare, not to carry out their threats. But this year has been a tragic one, with shooting deaths at several campuses, including the October murders at Oregon’s Umpqua Community College , in which a shooter killed nine people and injured others. In November, during a period of protests over racial tensions on many campuses, more than a dozen colleges reported threats of gun violence or bombs . Washington College, in Maryland, closed for several days before Thanksgiving because of a police search for a missing student who was believed to be armed. The student’s parents told the college that he had retrieved a rifle case from his family’s home earlier in the week and disappeared. On the weekend before Thanksgiving, authorities found the body of the student, Jacob Marberger , who died of a self-inflicted gunshot wound. Western Washington University called off classes  last Tuesday, citing hateful online comments made about minority students. On Friday, President Bruce Shepard released new details  about the online comments, explaining why he felt the need to call off classes and efforts made to protect students. He said his first statement was "incomplete," because of concerns about not saying anything to hurt ongoing police investigations. In his new statement, Shepard said he was cleared by investigators to share more information. He noted that some of the comments threatened violence and cited specific students by name. He said that security was being beefed up, and that the university was committed to protecting all students. "As a social scientist I know the strong empirical bases for the unequivocal conclusion that our society remains characterized by potent forces of racism, structural oppression, systemic inequity and exclusion," Shepard said. "Our university, inextricably embedded as we are in that society, is affected by those societal forces. And, higher education's own culture and organization cannot help but also reflect those same problematic attributes. As I always preach, though: there is nothing wrong in acknowledging that there are problems here at Western; we should only be embarrassed if we try to sweep them under the rug. Or, do nothing about them." In Los Angeles on Sunday night, two film students were arrested when they appeared in a highway overpass, with one dressed in military-style fatigues and one holding what appeared to be a rifle. At least 10 motorists called 911, believing that a real attack might be about to take place, and the highway was shut down. 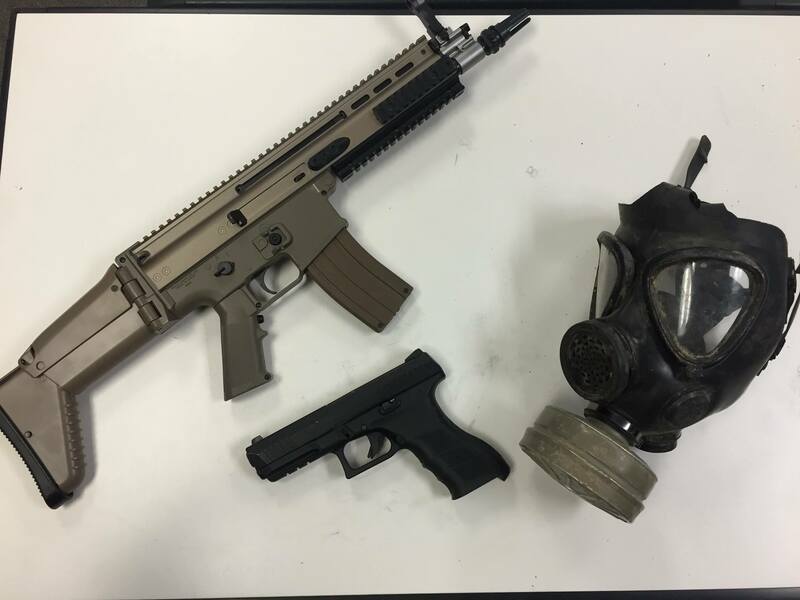 When police arrived and detained the students, they were found to have a replica assault rifle, a replica handgun, military uniforms, cameras and a gas mask (photo at right). The students told authorities that they were working on a college project. The two were arrested on charges of displaying a replica firearm and causing a false emergency. The Los Angeles County Sheriff's Department released this statement from Captain Patrick S. Davoren: "While the intentions of these two individuals might have been harmless, the fact that anyone would appear in a public place displaying a replica firearm is troubling. These two men put themselves and our community at risk. This does reflect the fast actions of our community in notifying law enforcement and reminds everyone that if they see something, they should say something." The statement did not identify the students' college, but The Los Angeles Times  reported that they said they were completing a project for a film class at Moorpark College. In February, a highway in Atlanta was shut down for two hours  as officials first investigated and then blew up a device that had been attached to a bridge. Authorities feared it could be a bomb. But it was an art project of a student at Georgia State University. Students in an art class had been told to place cameras in places that would yield interesting photographs. The university has since removed other cameras from public places. That incident was one of a number involving art students . At Ohio State University on Sunday, a former employee shot and killed himself in the university's Wexner Center for the Arts, The Columbus Dispatch  reported. The individual, who last worked at the university in 2009, vandalized art before killing himself.